Nous débutons l'année 2019 avec "Opening", une exposition consacrée au travail de Jungjin Lee, artiste coréenne que nous avions exposée pour la première fois en 2012 et dont le succès international s'est depuis affirmé. Opening, est le titre de sa série la plus récente, que nous associerons dans cette exposition avec des pièces plus anciennes (Ocean, 1999). Dans Opening, Jungjin Lee revient dans les paysages désertiques qu'elle affectionne, en Arizona, au Nouveau- Mexique et au Canada. La nature dépouillée et inhospitalière de ces lieux solitaires, souvent arides, la fascine depuis ses premiers voyages dans les déserts de l'ouest américain. de Chine et du Japon (Kakejiku), nous amène surtout à considérer différemment le paysage. Il est évidemment tentant de photographier l'horizon de ces grands espaces dans un panorama qui semble avoir été inventé pour eux, mais basculer le cadrage à la verticale nous invite à une lecture plus abstraite en même temps que plus spirituelle de ces paysages de roches, de sable, de vent. On peut en effet retrouver un écho de la simplicité des peintres et calligraphes zen dans ces images dépouillées, axées sur l'opposition fondamentale ciel-terre. Jungjin Lee réalise ses tirages selon une technique bien particulière qui leur confère une matière et une présence qui n'appartient qu'à elle. Durant de nombreuses années, elle a utilisé des papiers enduits d'une émulsion argentique liquide pour chacune de ses épreuves. Elles étaent donc toutes singulières, cette façon de tirer étant trop soumise aux aléas d'un processus de tirage peu contrôlable. Depuis "Unnamed Road" (2011), Jungjin Lee réalise un premier tirage de cette manière "traditionnelle", puis le scanne. Cette étape numérique lui permet un ajustement fin du contraste, de la densité. Elle réalise ensuite l'édition en tirage jet d'encre pigmentaire. La série "Opening" est tirée de cette manière sur un papier artisanal coréen en fibre de murier. L'édition est limitée à dix exemplaires, plus trois épreuves d'artiste. La série "Ocean" est de celles que l'artiste a encore tirée sur papier émulsionné à la main. L'image occupe la totalité du format du papier, sans marges. Edition limitée à cinq exemplaires au format 76 x 145 cm et trois exemplaires au format 99 x 198 cm. ouvert et présent au monde." Jungjin Lee est née en Corée et vit aux États-Unis depuis 1988. Diplômée en photographie de l'Université de New York, elle fut assistante de Robert Frank. Elle pratique d'abord une photographie à caractère documentaire, mais s'oriente dans les années quatre-vingt-dix vers une recherche formelle où la matière photographique est traitée avec la plasticité du dessin. Depuis notre première exposition "Wind / Thing" à la galerie en 2012, l'oeuvre de Jungjin Lee a été exposée dans de nombreux musées et galeries à travers le monde. 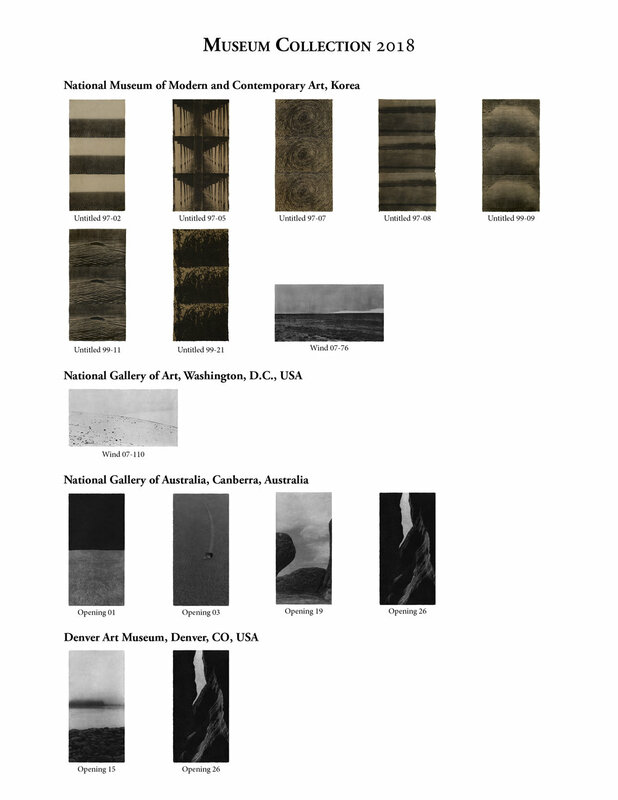 En 2018, ses photographies ont intégré les collections du National Museum of Modern and Contemporary Art, Gwacheon, Corée, du Denver Art Museum, États-Unis et de la National Gallery of Australia, Canberra, Australie. Une signature sera proposée durant le vernissage. An exhibition of photographs by Jungjin Lee, known for her captivating primal landscapes, will be on view at Howard Greenberg Gallery from September 12 through November 10, 2018. The exhibition, which marks Lee’s second solo show with the gallery, is entitled Opening. A book of the same name with work from 2015 to 2016 was published by Nazraeli Press last year. An opening reception with the artist will be held on Wednesday, September 12, from 6-8 p.m. The exhibition focuses on the theme of death and transience with a selection of works, mainly of painting and photography, which enable a conscious, inspiring and also pleasurable encounter and reflection. Artists as experts for transformation often raise the question of death in an explicit or indirect way. Through their individual approach, the selected works convey a differentiated view of the subject. They range from newly interpreted still lifes to the study of matter at the border of abundance and decay, to the representation of ruins as well as skulls to visible and invisible phenomena of perception. Our focus is on life and on the question of how all the moments are lived before the moment comes. Robert Frank described Jungjin Lee's picture series as "landscapes without the human beast" and referred to the poetic power in her photographic works, of which an exemplary selection from various series can be seen in the exhibition. Jungjin Lee's deserted landscapes, meandering through paths and paved roads, testify to his existence despite the absence of man. The play between absence and existence is a topic to which Roman Signer and Ester Vonplon have also devoted themselves. While Ester Vonplon's close-ups of snow and ice landscapes refer to the beauty inherent in every inch of nature that can be understood as documents of being, she intervened in nature for her latest series of images. These are colorful pictures that show a contamination of snow by the artist, which seems to be forgotten as soon as the dyed matter dissolves by itself. At the same time, Ester Vonplon subtly asks the question: where do the colors stay when the snow melts? The installation of Roman Signer also encourages a search for clues. In an almost absurd combination of place and objects begins a speculation about the sequence of events. Making pictures in Israel and Palestine was above all an emotional challenge. My photographs usually deal with something eternal in the landscape, but in this place the layers of history and conflict, fear and hostility, frustrated my camera. I happened to travel a lot in the West Bank, not for any political purpose, but because I liked the landscape between the cities. I tried to gaze at the land, without prejudice or judgement. I didn't want to deal with the masks of the people and I didn't want to put on my own mask. I wanted to see it as the olive tree sees it. But I felt overwhelmed by the realities around me. I felt sad and uncomfortable much of the time, and I found myself trying to make photographs in a place I didn't want to be. It was difficult, but looking back, I can see that it forced me to change as an artist and I am grateful for that. On my final trip, I was able to see, not only the land, but my own mind, with its uneven terrain and movements, and to touch something elemental. While I am not regularly drawn to landscape photographs there are several notable exceptions. Jungjin Lee’s work is one of them. For a landscape photograph to work it has to have an elemental simplicity and balance, a beautifully nuanced tonality and a spirit, inner light or magical presence. Jungjin Lee’s works presents these elements in a uniquely identifiable way: at once beautifully conceived and executed, powerful yet understated, meditative and generally serene. They are consistently important works of art. Her earlier work utilized a liquid photosensitive emulsion brushed on handmade Korean mulberry paper. The texture of the paper, its irregular edges and the gestural marks of the brushstroke as well as the noticeable grain and muted tonality of the silver in the emulsion create unique, deeply resonant painterly images. This recent work is also remarkable. The pigmented inks printed on artist papers yield beautiful more even, crisp and graphic art works. The series "Opening" is at once compressed and contained creating a more intimate focus and feeling of being let in on or discovering something special. Andrew Bae Gallery is to be commended for presenting this extraordinary body of mature photographic art. >>click here to view more..
Diane Arbus, Ruth Bernhard, Edward Burtynsky, Bruce Davidson, Louis Faurer, Robert Frank, William Klein, Dorothea Lange, Jungjin Lee, Vivian Maier, Alex Majoli, Robert Mapplethorpe, Joel Meyerowitz, Charles Moore, Arnold Newman, Gordon Parks & Marc Riboud. Let it go. Let go of all delusions and conceptions. Of images of what photography is supposed to be, perfect photography. What the wind is. The sea. The desert. Or a simple ceramic bowl. Let go and follow Jungjin Lee, this visual poet who merges two cultures, Seoul, New York, the East and the West – Lee being the interface and the seam. Her images suture the philosophy of things with the philosophy of mind. For the first time, you can now see her works of the past twenty years in a museum environment in Europe – and anyone who encounters her is affected. Emptiness that is nothing more than form. Form that is nothing more than emptiness. Landscapes, natural details, serial-mounted landscape abstractions. White, black, and countless half-tones in between. Charcoal drawings from the darkroom. Image content and spaces treated in an egalitarian way and manually applied to Korean rice paper: Hovering, airy, comparable to a physical touch, a contact with sculptural calligraphy. All this is “Echo," the alternative visual experience, the metaphysical understanding of the image, a reverberation from the depths of the ocean, where beneath the movement at the surface, the restlessness of life – there is silence. Jungjin Lee, born in Seoul in 1951 – in her case, references are impertinence. And yet, one has to drop a few names: She is the artist who combined Robert Frank’s techniques of scratched, injured negatives with the minimalist conceptual art of the early Hiroshi Sugimoto. In the US she is highly quoted, there is not a single important museum that does not collect some of her works. Gradually and finally, she is also becoming better known in Europe. 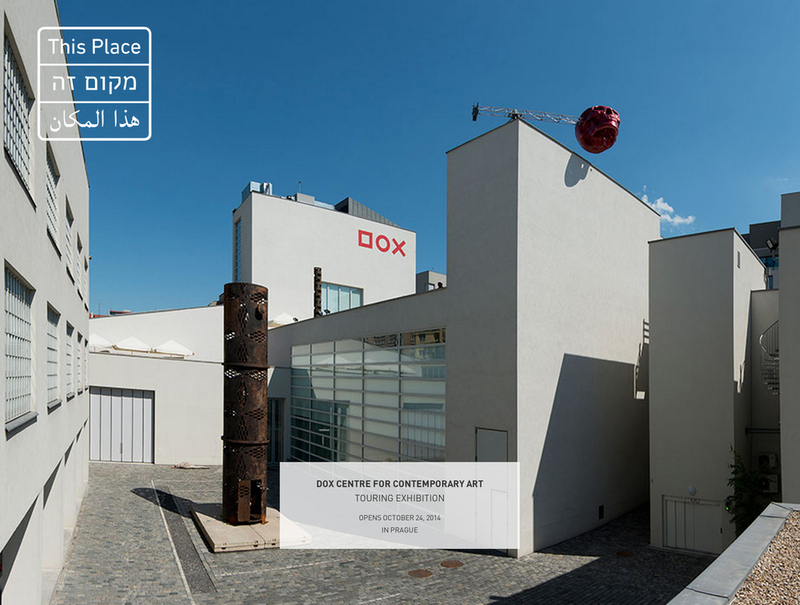 Her participation in the monumental Israel project “This Place” has definitely contributed to this success. Launched by the French photographer Frédéric Brenner between 2007 and 2012, it follows the tradition of the Farm Security Administration (1937-1946) under Roosevelt, who had the situation of impoverished agricultural workers documented. For “This Place”, Lee and eleven other internationally renowned photographers, such as Jeff Wall, Gilles Peress, Fazal Sheikh and Thomas Struth, travelled to Israel and Cisjordan. In the end, the Korean’s position and artistic outcome in New York proved to be at least as strong as that of the most renowned contributors, independent, personal and more than matching her competitors’ works. She later called the installation “Unnamed Road” and, as always after the end of a series, published an artist's book of the same title. Together with many others, this publication forms part of the exhibition, as an artist’s edition and in other versions. Jungjin Lee exclusively in Winterthur and without exception with works from her personal archives: There is only one lender in this case, and that is the artist herself. Winterthur and the exhibition “Echo” are worth a trip – and more than that. Prerequisite is, however, that the traveller comes provided with time, an open mind and an open heart. Ultimately, it is quite simple. As simple as the image contents seem. Lee's object-like suspended particles exude a peace and quiet as only views of the open sea or the endless desert do. "Echo" was prepared for years and finalised by Urs Stahel, the museum’s founding director. Now Thomas Seelig can finish the work and present a silent sensation: Jungjin Lee in Winterthur is a highlight in the history of this probably most important photo museum in Europe. Not only does the house show itself at its most uncompromising best, it has also improved technically – with new LED lighting. For “Echo”, Seelig lets more daylight than usual into the rooms, and so the image bodies seem to vibrate and hover even further away from the walls than possible and strive towards the cold, high bluish grey of the sky. The deserts of “American Deserts” (1990- 1995) are collected by Seelig, the series “Ocean” (1999), “On the Road” (2000-2001), “Wind” (2004- 2007), but also “Things” (2003-2007), her later works, when the artist turned away from nature and towards abstraction. Especially in “Things”, these everyday objects, to which Lee attests a life of their own, her intentions manifest themselves. She puts her objects into a white void, as if they had made themselves at home there, a cosy home: “The empty space is more important than the photographed, represented object. It's like a dancer on a stage. He cannot move when there is no empty space around him. "Form and emptiness are not opposites; on the contrary, one is the constituent of the other. Only as a unit, only through the presence of both realities, Lee says, one and the other are perceivable in the first place. Of course, Lee is not the first to propagate emptiness as a form of poetry and life. Artists have always relied on the East Asian tradition, Peter Brook is in the theatre one of its most uncompromising representatives. Similar to emptiness, Lee also pleads for the imperfect and ephemeral. For this reason, the images collected in the context of “Echo” force the subject matter through a printing process from the 19th century. Hand-crafted rice or mulberry paper - margins torn, fibres visible on the image carrier – Lee paints a light-sensitive emulsion like a painter's act with a broad brush. It is not the artisan who determines each image, in the darkroom every images determines more or less itself how it wants to be seen. The only and reliable constant is the stain, the impurity, and this is what turns the beautiful into the perfectly beautiful. In Japan, Wabi-Sabi is the tradition, according to which only things that show a visible history can be beautiful. Texture and materiality have the same value as content. The “Ocean” spills itself at the viewer's feet with the specific weight of water. And the "Thing", the ceramic dish, burned in the darkroom, tells of its use and its users. Her Echo is as diverse as collective memory is. Lee's thought-provoking images are their pure resonance. Fotomuseum Winterthur: Jungjin Lee, “Echo”, until 29 Jan. 2017, Catalogue CHF 46. Verschiedene Reisen führen Jungjin Lee Anfang der 1990er Jahren in die endlosen Weiten Amerikas, wo sie Wüsten, Felsen, Gestrüpp und Kakteen in archaischen Urmomenten festhält. 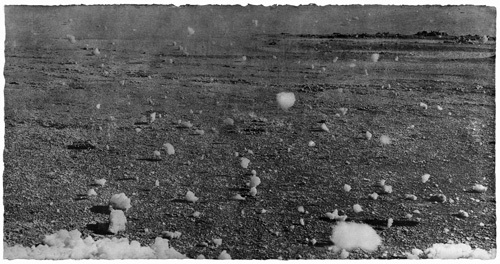 Ihre fragmentarisch poetischen Bildserien beschrieb der grosse Robert Frank als "landscapes without the human beast". In the early 1990s, Jungjin Lee (*1961 Korea) travelled across the endless expanses of America, where she captured its deserts, rocks, bushes and cactuses in archaic, primal imagery. 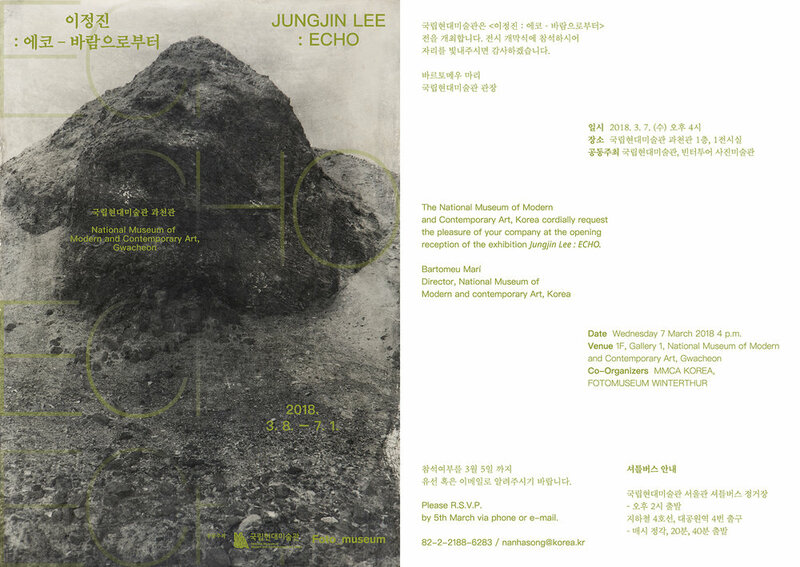 Starting with this early landscape series, the exhibition Jungjin Lee – Echoat Fotomuseum presents eleven groups of works, a first retrospective showcasing a visual oeuvre that now spans two full decades. The great Robert Frank once described Lee’s fragmentary and poetic images as “landscapes without the human beast”. He was referring to the near-complete absence of people in the work of Jungjin Lee, even though her photographs may portray traces of civilisation or include her own body inserted into the picture. Alongside her American Desert(1990–1995) series, the artist developed an early tendency to work on the boundaries of different cultures, living and travelling widely in Korea and the United States. With Pagodas(1998) and Thing(2003–2007) she created two important cycles of works in which she liberated objects by means of templates and a soft and precisely calibrated lighting. With a sleight of hand, for instance, the upwardly tapered structures of five story brick-built pagodas are mirrored in their foundations. Through this doubling of volume, the pagoda ‘not only grows in height, but also becomes rooted in the depths’ (see Lena Fritsch in the accompanying publication). Within the exhibition space, the artist adopts the East Asian theory of the harmony of objects, presenting five pagodas next to one another. The world of signs in Thingis also carefully balanced between object and plane, volume and non-volume. Hand-crafted bowls, vessels and furnishings are imaged with a subtle sense of placement. Whether centrally positioned, at the upper or lower edge, or radically cropped, the objects take on an auratically charged life of their own within the large-format space of the picture. Further groups of works in the same vein include Ocean(1999), On Road (2000–2001) and Wind(2004–2007). The artist manages to create powerful photographic images that exude a transcendental and almost meditative sense of composure. Lee does not aim for topographical or factual attributions when she wanders through a grimy and all but abandoned mining town, when she contrasts the imagined expanses of the oceans in darkly detailed views of water and land, or captures almost imperceptible natural phenomena such as the weather in metaphorical images. With her fundamentally artistic approach, Lee pushes the boundaries of photographic narrative, seeking significance and meaning on the interface between ‘non-place’ and ‘non-moment’. the flaws in the uncontrollable natural process. Far from being seen as defective, these finely grained analogue prints with their blemishes and imperfections constitute an intelligent departure from photography’s purported claim to truth. For once, the technical medium seems to be liberated from its own inner logic, offering the viewer a visceral and elemental approach to the image that is rarely found in contemporary photography. The exhibition is supported by the Volkart Foundation and the Friends’ Association Fotomuseum Winterthur. Additional funding by the Walter Haefner Foundation, Hunziker Betatech AG and the Dr. Georg and Josi Guggenheim Foundation. An accompanying catalogue will be published by Spector Books, including a short introduction by Thomas Seelig and essays by Lena Fritsch, Hester Keijser and Liz Wells. Press Material And High Resolution Press Images Can Be Downloaded At Press.Fotomuseum.Ch. The opposite of Guitty in its silent stillness, the water’s edge is also the subject of Jungjin Lee’s desolate Wind 07-80 (2007), one of her typically lyrical landscape prints where the feel seems more important than the subject. Water also pervades Nadav Kander’s painterly Untitled IV(2016), a great vertical calm of dark green sea and light green sky pricked by a horizontal sliver of coast. It looks as much like a painting by Whistler as it does a contemporary photograph. By contrast, water only punctures the tranquility of Japanese photographer Takeshi Shikama’s vast Galician treescape, with its inaudible waterfall a tiny but vital detail in an overwhelming forest. Jungjin Lee, née en Corée en 1961, a commencè à photographier au début des années 80 durant ses études d'arts (spécialité en céramique) à Séoul. Elle s'installe à New York en 1988 pour suivre des cours de photographie (New York University). Elle y réside depuis lors, se consacrant à ce médium, qu'elle traite d'une façon très plastique, réalisant notamment des tirages sur papiers coréens en fibres de murier sensibilisés au pinceau. Les lieux photographiés par Jungjin Lee ont une présence étrange. Tels des paysages mentaux, ils semblent naître d'un rêve. Cela tient en partie à la nature de tirages dans lesquels le réalisme photographique se mèle à une matière picturale qui fait songer au dessin. Ce travail sur la forme est nécessaire pour faire de l'image un espace de méditation, pour donner à voir, sous la surface visible, "le coeur immobile des choses". Jungjin Lee donne à sa photographie une dimension existentielle, celle d'une interrogation sur notre présence au monde. Dans plusieurs de ses précédentes séries, Jungjin Lee a photographié les espaces désertiques de l'ouest américain. Les Everglades sont à l’opposé du désert aride. Mais dans cette nature primitive, où l’homme n’a pas facilement sa place, elle a retrouvé la même confrontation avec un lieu essentiel, mélange inextricable des éléments (eau, ciel, terre), pénétré et sillonné par la vie. "Les Everglades m'ont poussé à voir différemment... D'en haut comme un si j'étais un oiseau, et d'en bas comme si j'étais un serpent". I proposed that my project would be based in the deserts and the land that contains layers of history. The land is always changing but there is some very fundamental truths that never change and that is what I wanted to concentrate on. The communities that have shaped the land are different, from Jerusalem to Bedouin society… The land is different – its climates – but it is the people who live there that make the diversity of the land. But there are landscapes such as the mountains and the hills along the West Bank to Nazareth that are very spiritual. It’s not purely determined by nature, there are always fragments of life and what has been left there, just enough to feel what has gone on there. What I am searching for in my photographs is something about the life. It’s about the solitary state of being human. Life changes on the surface, like an ocean. You have the constant movement of water on the surface but deep down, at the core, there is no movement. On the final trip it was more… how can I say? You know the Buddhist term ‘nirvana’? It was as if I had finally let go of my aversions and delusions and could draw on something much more fundamental. It’s like ice becoming water; it was no longer solid, it spread like water. Maybe that isn’t noticeable for anyone else; it’s a very delicate notion. Each day, L’Oeil de la Photographie will present to you a series by a photographer. The acclaimed Korean artist Jungjin Lee will have her inaugural exhibition at Howard Greenberg Gallery from October 29 - December 12, 2015. 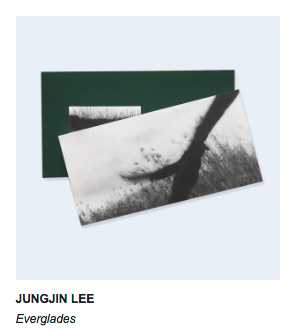 Jungjin Lee: Unnamed Road/Everglades will present photographs from two recent series. Unnamed Road is a body of work on Israel and the West Bank; with Everglades, Lee turns her focus to the Florida Everglades. Exhibition THIS PLACE at Tel Aviv Museum Of Art, May 14th-Sep 6, 2015.